Often people tends to worry about altering the large house hold items, like furniture, wall color and so when it comes to home decoration. There are several other easy ways by which you can able to do the home decor, usage of the decorative wall plates is one of the amazing methods to decor your home interior. Wall plates are the attractive and lovely items to hand on the wall, in fact; it can suit well if you hand them over the dining table. Modern home designers use these decorative wall plates as theme based home decoration purposes. These plates come in various shapes, colors and more importantly, it completely changes your home look. In addition, these decorative plates manufactured by several materials like ceramic, wood and even on porcelain, marble and so. The plates, which made from the natural decorative stone, marble is highly in demand among the modern house owners and house builders for constructing houses with more attractive manner. When it comes to decorations, the natural stone, marble cannot ignore by all. In fact, some might suggest metal decorative plates, on accounting of the durability factor. However, metal plates might cost higher when compared with handmade pottery plates or with others. In addition, on regular usage, the metal plate requires a significant amount of maintenance cost. If you are interested in high quality decorative plates with high durable factor, preferring the natural stone marble would be the best option. Unlike other decorative plates, marble decorative plates or marble wall plates are the best methods to portray your arty aspect on your home interior. Artefactindia one of the leaders of manufacturing marble inlay products in India, manufactures these marble inlay plates with supreme quality. 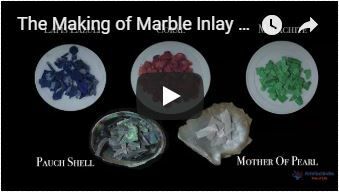 Marble inlay plates come with a variety of textures and colors. Apart from that, the flexibility of the marble stone and the custom design can well match your home interior accessories like furniture and so. In fact, if enhances the look of those featured pieces of the home interiors without altering or distracting the original appeal. Marble wall plates have the tendency to add extra ambiance and elegance to your home interior. In fact, you can easily alter the room atmosphere into romantic, sophisticated, sleek or fun filled place with the perfectly themed decorative marble wall plates. Artefactindia, manufactures several marble inlay products among those these marble inlay plates are very special. All the decorative wall plates of Artefactindia are manufactured by the vastly experienced artisans who came from the family in which their ancestor involved in the construction of the world famous love monument Taj Mahal cited in Agra city. Artefactindia expertise in manufacturing wide range of decorative marble wall plates in various designs, size, patterns and inlaid with various precious stones that are highly attractive and elegance in nature. Unlike various manufacturers, Artefactindia providers custom solution for the consumers who loves to have specific art work on those decorative wall plates as per their own interest. Marble inlay plates can be the perfect choice for corporate gifts, seasonal gifts apart from being a home decorative purpose. Unlike other natural material or artificial materials, marble stone posses several advantageous factors. Artefactindia uses only the highest quality best marble stone for manufacturing the wall plates with strict quality control rules. With the aid of advanced technology along with the experienced artisan’s knowledge, all the marble inlay products, especially the marble inlay decorative wall plates manufactured under the industry laid norms and standards. Being a wholesale seller, retailer, and worldwide exporter, Artefactindia sell their products for affordable rates.